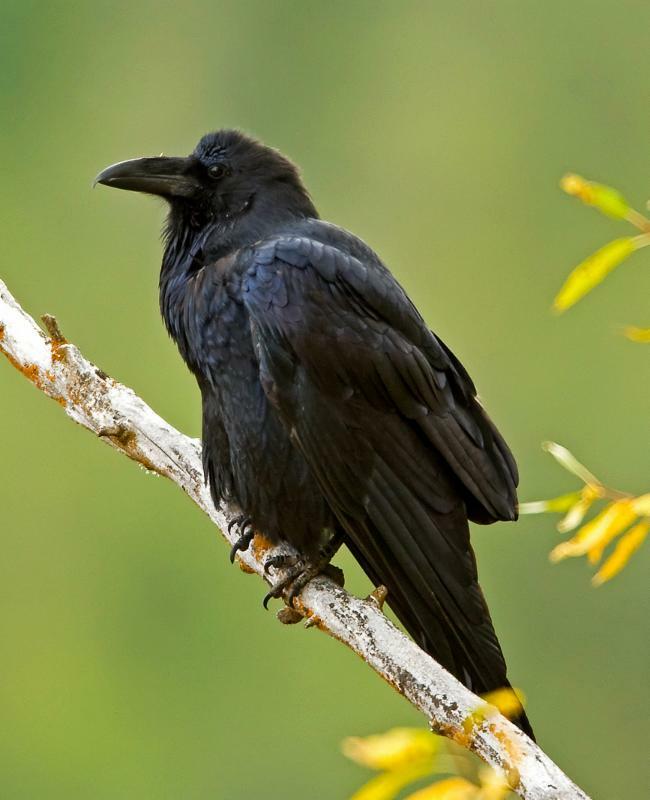 include crows and ravens, are easy to spot and are fairly common. At a distance, both look very similar, and their all-black plumage makes identification tricky. With these tips and some practice, you’ll be able to separate crows and ravens with ease. If in doubt, remember that it’s easier to turn a crow into a raven, than a raven into a crow. Size: When together, crows and ravens can most quickly be separated by the unmistakable size difference — ravens are much larger than crows. Ravens stand taller, and have a much larger, longer bill that can help distinguish them from their smaller crow cousins. In flight, the ravens’ larger, longer wings and tail, lend an overall impression of an eagle or larger raptor rather than a crow. Shape: Ravens are just bigger all over than crows, with a much thicker beak and bulkier body. In flight, their tail is diamond-shaped, presenting a pointed feel to it. Crows have much shorter, rounded tails. Voice: Does the bird caw or croak? The easiest way to distinguish between crows and ravens is by their call. The raucous “caw” of the American Crow is familiar to urban birders. The throaty croak of a Common Raven is quite different. Ravens and crows have a vast repertoire of vocalizations, and can even mimic human vocalizations and mechanical sounds.